The workshops are a combination of learning about the spiritual world and how to interact with it and an experiential piece of group energy healing . Many of you, like most people, know very little or might be skeptical about spiritual energy healing. 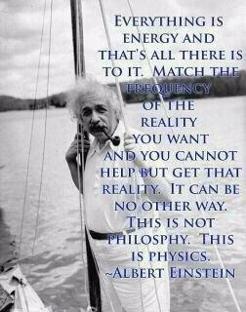 In short, as all we are is energy (see Einstein in the picture), the source of all healing— mentally, physically and emotionally—is based on spiritual energy. So by bringing down Divine light, we are able to start making progress on healing at the root of everyone’s problems. Having worked with approximately 1,500 participants in programs, energy healing calls, workshops, daily / monthly energy programs and as private clients, I have seen tremendous transformation. While each person is unique, most people have developed much happier, more fulfilled, less-stressed lives, and have been able to make great progress in overcoming their lifelong emotional and mental blocks and challenges. In addition, these blocks are often the spiritual source of physical problems. And while not working on physical issues directly, I have witnessed numerous people overcome or improve significant physical challenges including pain, suffering, lack of movement, etc. Most people on the healing call experience a sense of calmness in their lives, relieved of the daily stresses and more in tune with their inner selves. Most sleep very well that night and usually have a much clearer head the next day and feel ready to conquer the world, or at least one’s little piece of the world. Many are now empowered to move forward where there had previously been stagnation or procrastination, while others stop reacting an being triggered by people or circumstances which have bothered them in the past. And other feel better physically. Each person has a unique experience and energy work has a cumulative effect—the more the better, and the more sustainable the effects. Why Can You Do This? I get asked all the time “how can I do this”. I am blessed and privileged to do this work in the merit of my ancestors, which include some of the top Kabbalistic Masters and Biblical Sages from 500-800 years ago. I also am a student of and work with as number of the top Kabbalists in the world today.